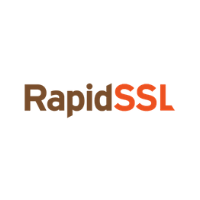 With a RapidSSL certificate you can obtain HTTPS encryption for your website quickly at highly competitive prices. This Domain Validated (DV) certificate is ideal for websites conducting low volume transactions. Issued in minutes. Don't wait around to get your encryption. Discounted prices from us. Includes a $10,000 warranty. Wildcard option for websites looking to secure subdomains. If you are interested in purchasing this certificate, then Servertastic recommends PositiveSSL as an alternative.